In the late 80’s or early 90’s, Doordarshan telecast a fantastic series titled ‘Portrait of the Director‘. It featured six documentaries on six acclaimed directors of Hindi Cinema. It was in the episode on Shyam Benegal, that I first heard about this book. His acclaimed 1977 film, Bhumika, starring Smita Patil in the award winning title role, was based loosely on this “autobiography”. Hansa Wadkar (1923-1972), born Ratan Bhalchandra Salgaokar, was a well-known Marathi actress of the 1930s and 40s. 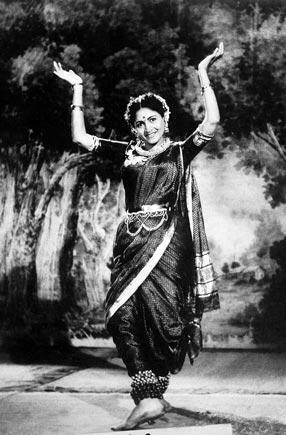 Making her debut at the age of 10, Hansa Wadkar starred in several Marathi and Hindi movies, including two of Marathi cinema’s biggest hits, Lokshahir Ramjoshi (1947) and Sangtye Aika (1959). It was a set of interviews appearing in a Marathi magazine, Manoos, in 1966 that culminated in her autobiography, Sangtye Aika (You ask, I tell). The book form, which became a bestseller, was published in 1970 and received the State Government Award for Best Autobiography in 1971. The English translation, by Jasbir Jain and Shobha Shinde, was published by Zubaan Books last year. Episodic in structure and forthright in tone and voice, Hansa Wadkar’s memoirs give us an insight into her unconventional, difficult and tragic life, dwelling upon certain events more than others. Born on January 24, 1923 in Bombay to Bhalchandra and Saraswati Salgaokar, Ratan was the third of four children. Her eldest sister (whose name she later took as her screen name, Hansa), and her youngest brother died early. Her brother Mohan and Ratan were the two surviving children. Her grandmother Jiji was a wealthy courtesan and an influential figure in her childhood. Hansa’s mother was from a family of devadasis belonging to the kalavantin community. To avoid any family disputes, Jiji divided her property and left a house in Sawantwadi to Ratan’s father. So from Bombay, the family moved there. Ratan’s upbringing was in a household, dominated by strong women – her grandmother, aunts and mother. Her grandfather was bedridden, after having contracted tuberculosis. Her father did nothing for a living, besides being passionate about the tabla and addicted to alcohol. Ratan’s aunts (father’s sisters) Kesharbai and Indirabai were already acting in the movies. To protect the family honour against the stigma of women working in the movies, Indirabai had adopted the name ‘Indira Wadkar’. Her youngest aunt, (whom she was very close to), Susheela tai was married to Master Vinayak (the renowned actor/ director and Nanda’s father). Ratan’s early childhood was fairly happy. She was extremely fond of her father and was close to her brother, Mohan. The mother-daughter relations are fraught with tension from the beginning. Her grandmother, Jiji, was of the opinion that girls should be trained in all arts – music, dance, swimming, reading. And hence paid attention to Ratan’s training. Ratan hated learning music, even though she had a good voice. Her education was in a Marathi medium school in Sawantwadi (till fourth standard ) followed by two years in an English school in Bombay. Ratan enjoyed studying very much and had wanted to study further. But that was not to be. In Sawantwadi, there lived a rich family, across the road from her house, whom they were close. Her mother often encouraged visits from the boys of the household and would keep sending Ratan there. Jagannath Bandarkar, Hansa’s first husband, was from this family. He was 10 years older than her and would constantly fondle her and pressure her to marry him. To escape from this constant harassment, a 10 year old Ratan promises to marry him. Her father’s increasing alcoholism soon meant that money was tight. Her aunt, Kesharbai, suggested that she act. And the decision was made. At the age of 10, to supplement the family income, Ratan entered the world of movies and became Hansa Wadkar. By the age of 16, Hansa Wadkar was a name. According to the translators, she did achieve unprecedented success and much acclaim back in those days. She was also married to Jagannath Bandarkar, who then controlled her finances and contracts. The marriage, needless to say, was an unhappy, abusive one. After having been coerced to hold good on her childhood promise, Hansa soon found that there was no basic compatibility on any level. All Hansa wanted was a simple domestic life. He clearly had married her so that he could ride on her success. She was not allowed to stop working. Pregnancies were either forcefully aborted by her husband or ended in miscarriages due to her stressful life! Her only surviving child, Rekha, was born in 1942. She had no family support. Her father and brother had died; she had no one to share her sorrows with. Slowly she was driven to alcohol. She speaks about how she used to come home at 3 am or 4 am every morning, eat alone and then go to bed and then wake up at 11 am and go for shooting. Days would pass in such a routine and complete silence. And whenever she and Jagannath would talk, it would end in a quarrel as he would try to control each and every movement of hers. “Domestic bickering, worry for my child, the loathsome ways of the film world, all pushed me to drown myself in alcohol.” While she tried not to drink during shootings, the rest of the day was spent in a drunken stupor. During the shooting of Sonaiychi Lanka in Kolhapur, one night, she was desperate for a bottle of alcohol. The shops were shut and the waiter could not get her any alcohol. As she begged and pleaded, the man in the room next door sent her one. Joshi, this man, and Hansa soon became friends. After a particularly bitter fight with Jagannath, one evening, Hansa ran away to Joshi and spent the next few days drinking in different hotels. Soon money for alcohol was tight and they went to his village. It was then that she realised, he was an already married man with three wives (one dead and two alive)!! The next three years were spent in forced captivity. Having no place to return to, Hansa quietly accepted this and tried fitting in. Hansa worked hard, toiled and soon got along with the other wives and all of his children. She secretly wrote a letter to Jagannath, who then came with the police to take her away. The police took her to an old magistrate’s house, where that man raped her. She did not say a word – she was angry but chose not to file a complaint. Jagannath had been sent away earlier on some pretext of getting a signature. Hansa came back and got back to movies. Soon she walked out on Jagannath and also decided not to claim custody of Rekha. She did not want her daughter in the world of movies and theatre. By the time, her memoirs end, Hansa had given up alcohol for ten years and had settled to a ‘more normal life. Her daughter by then had grown up, gotten married and had two kids. She did not keep in touch with Jagannath Bandarkar, even though she held him in great regard – as he was her anchor in many ways. At the time when these interviews were conducted by journalist, Arun Sadhu and the book was published in 1970, Hansa Wadkar was very ill. She had been living with Rajan Javle, a kinder and a more supportive man than the others in her life. He was the one who helped her when she had walked out on Jagannath and gave up her alcohol. She died , at the age of 49, in September 1972. What struck me about the book was the candour of the tone. She states the facts of her life, as is. There is no attempt to glorify either her fame/ success or the innate tragedy. She did not get what she wanted. She was abused and exploited in all her roles – daughter, wife, actress. But there is no attempt to portray herself as a victim. Her dignity and self-respect stand out in each chapter. What also amazed me was the lack of any bitterness or resentment. Jagannath Bandarkar manipulated her, sexually abused her when she was a child, and then exploited her fame for his material benefit. But there is no rancour, when she writes about him. She is objective enough to see the good side in him. He was a good father to their daughter and she gives him that credit. She is also honest about her own flaws. Stubborn, fiery and rather contrary, some of her misfortunes were a result of her own character flaws. Angry at being accused by her mother (in a drunken fit) of sleeping with Jagannath, Hansa then proceeds to do just that in an act of defiance and becomes pregnant. Again, later, when the suspicious Jagannath accuses her of flirting with her co-stars and drinking and beats her up, she pig-headedly decides to do that. In trying to spite others, she ends up causing the most harm to herself. All this is recounted with an innocence and dignity that is touching. One feels for the lady. In the book, Hansa Wadkar talks extensively about her co-stars, directors, and writers, creating, through small anecdotes, a picture of the nascent Marathi film industry. She talks about her conflict between the charms of a simple, domestic life and the lure and intoxication of the face paint and arch lights. 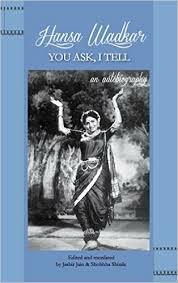 She writes warmly about Himanshu Rai, Devika Rani, Master Vinayak, Baburao Pendharkar, V. Shantaram, among many others. 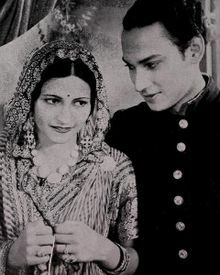 Durga Khote finds mention, as a co-star, in an anecdote in which she saved Hansa’s life during the filming of a tonga scene for the film, Khel Challa Naseebcha. They were picturising the shot in a mountainous terrain, where the tonga (with both Durga Khote and Hansa on it) would go a few steps forward and then a few steps backward. Durga Khote would sit on the tonga during the forward shot and would step down the moment, it would start going backward. She advised Hansa to get down too but Hansa didn’t listen. The third time this backward shot was being taken, the frightened horse didn’t stop and started hurrying backward towards the precipice. The rest of the unit watched in horror and Hansa was too scared to do anything. Durga Khote, showing extreme presence of mind, pulled Hansa out of the tonga. Hansa landed on a heap of stones; but the tonga and the horse fell down the mountain. The tonga was broken and the horse dead. Another interesting and telling anecdote was how Shobhana Samarth refused to shoot when Hansa Wadkar was on the sets of a film. Hansa, then 15, had gone there with an acquaintance to watch the shooting. Samarth, from an elite and moneyed family said that she would not act as long as these cheap, low-born people are on the sets! Marathi cinema seemed to be dominated by upper middle class people and Hansa Wadkar, hailing from a family of devadasis and courtesans was definitely outside this ‘respectable’ circle! Hansa, to her credit, neither looks down upon her family, nor glorifies it. She simply decided not to go to any other film set without a prior invitation. The one thing that comes out in the entire narrative is how much Hansa Wadkar valued her self-respect and independence. She aspired for some independence and control over her own finances, making her, as Shyam Benegal put it, an early feminist. Yes, her wilfulness and rashness were responsible for some problematic situations and equations; but it is to her credit that she faced most of the nasty turns her life tossed up with a quiet and remarkable dignity. It is this honesty and lack of self-pity that makes the book a worthy read! This entry was posted in Books and tagged Devika Rani, Durga Khote, Hansa Wadkar, Himanshu Rai, Jagannath Bandarkar, Master Vinayak, Shobhana Samarth, V. Shantaram. Bookmark the permalink. This such a fascinating story. I remember being quite stunned when you were narrating the story to me. What a tragic life, Her ability to regain any sort of normalcy is commendable. Sounds like it is a great read. Yes, very fascinating, Pri. Not too high on literary merit, Hansa Wadkar was clearly no writer. But the fact like way she states her life story, neither covering her flaws, nor glorifying her achievements, makes it a wonderful read. 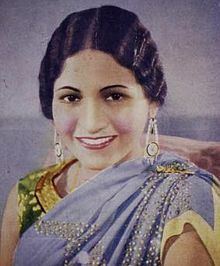 According to the translators, she was a very big name in Marathi cinema in the late 30s and 40s. I didn’t know that – and it does not come out in the book at all. My introduction to Hansa Wadkar was through Bhumika, which was shown on DD in the Dark Ages. After that, I read a lot about her – the newspaper archives were a great resource. I haven’t read this book, but I think I’ll pick it up when I come to India next. Thanks for telling me about the English translation. Was Bhumika shown on DD? I don’t think I have watched it. No recollection at any rate. Plan to watch it now. My introduction to Hansa Wadkar was through that programme I mentioned; Barring her name and some details listed on wikipedia, I knew nothing about her. I spotted this book earlier this year at the World Book Fair, and I had to pick it up. Thanks, Anu for reading and commenting! I must admit I’d never heard of Hansa Wadkar before, so this came as a revelation to me – and what a tragic one. The book sounds unusual (how many stars – or even people who never quite made it to stardom, but remained on the fringes – can avoid the temptation to exalt themselves and speak only of how good they’ve been?) I’d like to read this one. Thanks for the review, Harini. Yes, a very tragic story… Her name has been stuck in my head since I watched that programme ages back. Have not watched Bhumika though. Forget stars, how many ‘normal’ people have the objectivity and can avoid the temptation to speak highly of themselves. The book is not high on literary merit, though (naturally since it seems to have been culled out from a set of interviews). But the candour and matter-of-factness is touching. Thanks, Madhu! When you have time, do watch the entire Portrait of a Director series. Very informative. Remarkable woman- an original femme fatale.Came to know of this book while reading about Bhumika-one of my favourite Smita Patil movies.See if you can get it.Would be interesting to know how you would rate the movie. Thanks.Will be waiting for your views. 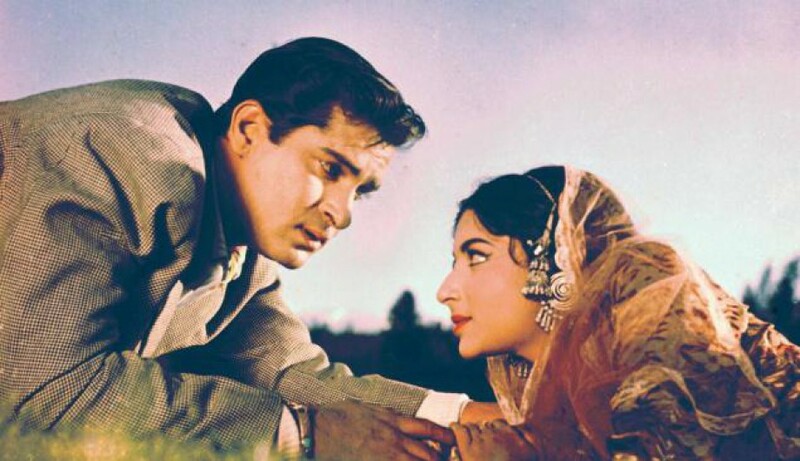 Pingback: Carnival of Blogs on Golden Era of Hindi Film Music – October 2015 – The world is too small? or Is it?